Marlborough, Massachusetts, July 2009. 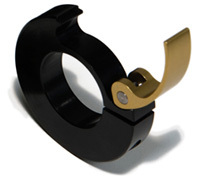 Ruland has developed and now manufactures quick clamping shaft collars. A patent is pending on the design. The new collars allow for quick adjustments and do not require tools. They are ideal for printing, packaging, medical, machine vision or semi-conductor manufacturing equipment to retain frequently adjusted items such as rolls of media, guide rails or other setup fixturing, or everywhere the need for tools is not practical. Quick clamping shaft collars are easily installed. The collars slide on the shaft smoothly. They have easy finger access to the handle that allows them to be removed or positioned without tools, using only the strength of the finger. The handle can be locked, fixing the collar in place. When installed, the handle is flush with the outside diameter which makes them suitable for rotating and stationary applications alike. The design features a tension-adjustment screw which makes the collar compatible to wide shaft tolerances and also adjust the axial holding power on the shaft.The collars work well on split hubs as well as on solid shafts. They can be modified by mounting holes to allow them to face-mount other components to the shaft. Quick clamping collars are made from aluminum for light weight and low inertia and have an anodized finish. The hardware on the collars is made from stainless steel which makes them suitable for wash-down applications, medical applications and some food applications. Quick clamping shaft collars are available with bore sizes from 5/16 ” to 1 ½ ” in the inch series and 8 mm to 35 mm in the metric series. Ruland shaft collars are also available in one- and two-piece clamp-style designs and set-screw design. They are manufactured in a variety of materials including 316 stainless steel, 303 stainless steel, RoHS compliant yellow zinc plating, high-strength aluminum with an anodized finish, black oxide carbon steel, and engineered plastic. Shaft collars are part of Ruland’s complete product line which also includes rigid couplings with precision honed bores and five types of zero-backlash motion control couplings: beam couplings, bellows couplings, oldham couplings, curved jaw couplings and miniature disc couplings. Ytterligare storlekar finns. Med innerdiameter (ID B) mått 38, 40, 42, 45, 48, 50, 54, 55, 60, 65, 70 och 75 mm. Begär separat information.